Hover effect gives a lively touch to your blog or a website and css has made it very simple for us. Just use few lines of code and there you go. Basically when mouse is placed over something for example text then it is called Mouse Hover or simply hover. 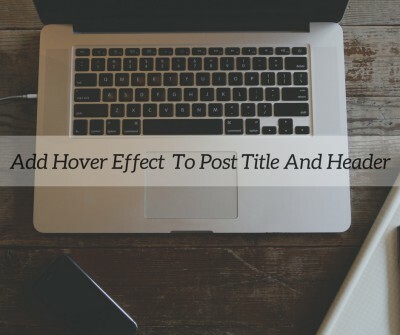 Today I shall tell you how you can add hover effect to post title and header in your blogger homepage. This post consists of two parts basically: first for post title and then for header! Now let's just come to the point and apply our easy steps to make your blog look more amazing! Go to your blogger account. Click on Theme and backup your template. Save your template and you are done! Using Padding will also give animated look to the Hover effect. For that type padding: 0px 0px 0px 10px anywhere in the code. Now I will tell you what transitions are and how can you use them? We used transitions here to specify how much time or seconds the effect would take to complete. We used half of a second here. -Webkit- is used for Chrome and Safari, -o- is used for Opera, -ms- is used for Internet Explorer and -moz- is used for firefox! Specifying them separately is a good practice and it will avoid inconsistency between the hover effect for different browsers. Visit your Blog on Google Chrome or Mozilla Firefox and right click on the Header or main title of your blog. Click on Inspect Element from drop down menu. A window will pop up. Search for your Header css and copy it just without brackets. Now click on Theme again and Backup your template. This will prevent you from losing the code if you suddenly do anything wrong! Now search for ]]></b:skin> in Edit Html. Note: Change opacity as you wish max is one and min is zero. Enjoy!